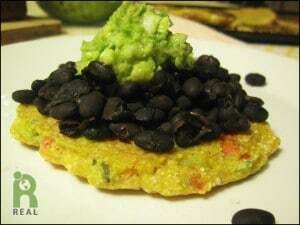 Corn cakes! These are so easy to make and so good to eat. Serve them up with guacamole and beans. In a small bowl, beat 1/2 cup water in with ground flax seeds. In a small pot, boil 3 cups of water. Add carrots and let cook for 90 seconds. Remove and drain. In a large bowl mix corn meal, salt, flax seed mixture and remaining water. Add in carrots and scallions and mix well. Heat a cast iron griddle or skillet on medium high. Lightly grease with oil. Pour 1/4 – 1/3 cup of batter on the griddle for each cake. Add as many as will fit on the grill, about 1 inch apart. Cook for several minutes until the edges are dry. With a spatula flip the cake and flatten it down. Cook another couple of minutes until lightly browned. Serve immediately.